My last post highlighted my recent use of a web tool, Meograph, in creating a history resource about Australia’s history for my 5/6 team at school. While my previous blog entry centred on my presentation of the topic, today’s post is more concerned with how I collected the information contained within my Meograph. Wikipedia can often get a bum rap from many in the education community. Sometimes, it’s for good reason, as it can be a VERY overused information source by students AND adults alike. I wrote a post in defense of Wikipedia back in March 2012 so I won’t go into battle for it again. Today I want to reflect on its benefits as a starting reference or secondary (maybe tertiary) source to start of your research, based on how I used it to research my History resource. When I undertook the task of creating my Australian History Meograph, I had no qualms about heading straight to Wikipedia as a starting point. I searched Australian HIstory timeline and sure enough, I found the Timeline of Australian History Page as well as, with the help of Google (the lazy student/researcher’s other ‘great friend’) various other timelines of varying quality, accuracy,reliability and depth. The Wikipedia timeline became my starting point for every moment that I added to my Meograph. It was a comprehensive, wide ranging collection of events in the history of my country, many even this old “font of useless knowledge” ( one of my official nicknames!) wasn’t aware of. However, it was just a collection of facts, which students might think is enough, but it isn’t. What I want my students to come to terms with this year is that bibliography filled with Wikipedia, Answers.com and Google Search results links is not a bibliography, nor is it evidence of any sort of research . Instead, each event on the Wikipedia timeline became the beginning of the real research as I sought out first of all verification on the actual date ( some were wrong – but then some were wrong on some official Australian government sites too! ), a collection of sites to corroborate the facts on the event ( while I was only able to reference one link on the Meograph, I fact checked every event with several references) and whenever it was possible, actual primary sources that proved the event beyond a shadow of a doubt. Now, of course, I could have done this without Wikipedia but I believe starting with the much maligned site had several benefits that will transfer over to the students’ use. Where do I begin? The biggest problem I have found with student research in the past ( apart from them just using Wikipedia and the first page of Google search results) is the difficulty they have getting started with a Google Search. Despite years of workshops on “How to use Google Search more effectively”, the problem still comes down to what do they actually type into the search engine. I’m of the belief that starting with a Wikipedia article sharpens the focus of a student’s research. This is because a wikipedia author has already pooled many of the basic facts a student needs into the entry, meaning the student has most of what he needs to research in front of him. Key Word search – From there, the student can better put together the required key words and phrases to make his search on Google much more productive. I’ll admit that I found better results using the basic points found in the timelines I used rather than thinking of what to search for with such a broad topic. Secondary source drives me to primary source – Because I knew I was starting from a secondary/tertiary source like Wikipedia or one of the other timeline sites I found, I was more focused in finding evidence from more specific sources. Starting from the secondary meant I had the basic idea I needed to complete my timeline event; what I needed was the primary source to verify the facts. I didn’t just do this with Wikipedia articles I browsed to; I did it to every site I went to, be it an official government or university linked-history site or a left or right leaning history site like Convict Creations or Creative Spirits. Having some specific details to work with though made it easier to search for evidence. As a result. 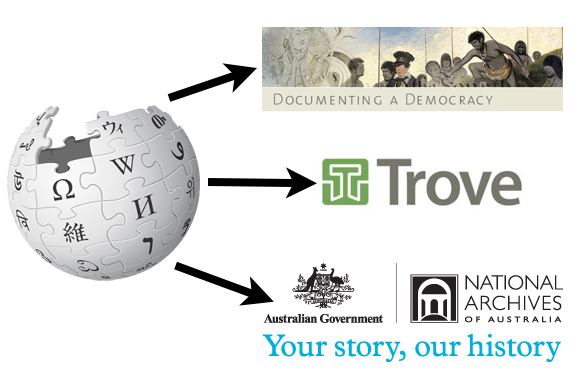 I came across some fantastic primary source sites for Australian history like Trove, a digital archive of historical newspapers from as far back as the first published newspapers in Australia; Founding Docs, a site that had scanned copies and explanations of all the bills and laws debated and passed leading to our Federation and future governments; the National Archives, which had a range of photos, videos, paintings and documents related to historical events. Effective time management for checking sources – Having the secondary source, in my case the various timelines ( I eventually left Wikipedia and and moved onto the Museum of Australian Democracy site’s more specific Federation timeline) as the reference point for all of my research, i used my time more effectively. I could go straight to a specific search for an event each time, rather than randomly searching for major historical events. This allowed me more time to check the validity of the websites I used, going to the About us sections that outlined who the authors were. I found out the Creative Spirits site was not run by Indigenous Australians at all, but a German/Australian with a big interest in their culture, who spent time sourcing info and getting approval from those whose history and culture he was depicting. Reading the introduction, I found out that Convict Creations was compiled by someone with a “fair and balanced” conservative leaning who spent time looking for alternative interpretations from the accepted left leaning history that is commonly accepted. The time I had thanks to using secondary sources as starting points allowed me to find a range of sources with different points of view that I can use with students instead of what I personally consider to be narrow views in official texts and resources from Education Departments. 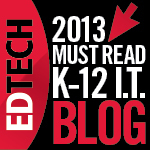 I want to be able to use this experience as a model for the students this year. In fact, I want to be able to lead them through this very process, not as a one off workshop presentation which just leaves them with a list of instructions they won’t follow effectively, but as a shared research experience. We have the technology for large groups to collaborate on research, starting from a secondary source like Wikipedia ( or alternatives) and sourcing references for various facts within the events. The technology that allows direct hyperlinking to references is also an effective way to check on the type of sources they are using as well. 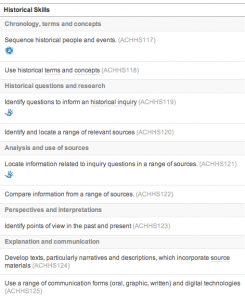 This would be a better way to develop the research skills that our History curriculum in Australia expects, particularly the Historical skills. As adults, we are expected t0 have advanced research skills. Students, on the other hand, are a long way off. We need to guide them to be better researchers. I think a good way ot start is to allow them to access secondary sources as a starting point to find the real evidence. What do you do when teaching research? I would like to know what others are doing. Join the conversation. Wikipedia – what are we afraid of? I’m one of the 23% who don’t ban Wikipedia. I don’t understand the concept of banning an information resource. I get the criticism of Wikipedia. I understand the limitations of Wikipedia. For the life of me, though, I don’t understand banning its use. Why are we in the Educational World so fearful of this Wikipedia thing that 73% of teachers according to this infographic still prevent its use? We all want our students to be good researchers. Part of this desire, I assume, has led us to develop programs in our classrooms that help to improve our students’ Web Search skills. I mention that because perhaps one of our problems with children and Wikipedia is that 99% of its articles end up on the first page of any Google Search. Are we banning Google Search? No. Well then, instead of banning Wikipedia, let’s look at whether we are educating our students in how to disseminate accurate information from the garbage. Why? – because the other 9 sites sharing the Top 10 Search page are just as likely to be as potentially unreliable as a source of information as the Wikipedia article, sometimes more so. So let’s work out how to support our students in learning good research skills through accessing the tool, instead of avoiding it. Wikipedia references its sources of information. Go to any article of useful length on Wikipedia and you will find linked references or quoted text sources. WIkipedia is often a summative recount of all those sources of information. It’s why students go there. It does a lot of the hard work for them. Now, if you want them to do the work, require them to seek out some of those sources and check the accuracy of that information. What is the reliability of the source site? What bias might this source have? What type of website is it? ( you can discuss the merit of .com v .org. v .edu or newspaper articles vs blogs or discussions) If we use textbooks instead of Wikipedia, isn’t this what we would be doing – comparing and cross-referencing for accuracy? Surely it is an easier learning task to check out 10 sources online than trying to flick between 10 different books and random pages within it? Technology isn’t about making it easier so that we don’t have to think. It’s about making it more effective so we do the job more quickly while still learning the same amount or possibly more. If we teach effective use of Wikipedia, this should be the result. Wikipedia is no more or less biased than any other source of information. One of the big bugbears with Wikipedia is that it can be contributed to by anyone. This can definitely result in biased, unsubstantiated garbage that needs to be filtered out. Any Obama/Bush/Gillard/Abbott/Lady Gaga/David Beckham/Charlie Sheen (etc, etc) hater can freely post hate speech on a wiki article. Eventually, though, it is found by Wiki editors and removed, but yes, by then it has already spread to the ill informed. But guess what? This same overheated, one way stream of half truths can be spread by every other form of media from both sides of the political, ideological or religious spectra. We don’t ban our Left wing or Right Wing shock jocks from spouting their diatribes of exaggeration on a daily basis. So why ban Wikipedia? Again, let’s use it along with the extreme views of other media sources to educate our students about fact and opinion, checking out both sides of the debate, fact checking your information. This is of far more educational value than banning a resource that has much to offer, despite its limitations. Wikipedia is about as accurate as any other resource. Check the stats. Look at the above infographic. We’re quibbling over 0.94 mistakes per article when comparing Britannica to Wikipedia; 2% accuracy differential when comparing textbooks to Wikipedia. Are those numbers a reason to brand it unreliable and ban it? When any school library would be full of books about the Solar System that still list Pluto as a planet and have atlases without East Timor on the map as a nation? There is no such thing as 100% accuracy. All surveys come with that +/-2% disclaimer. In the 21st Century Curriculum, in which critical thinking is one of the key skills, we should be embracing resources that encourage challenging their reliability and allowing us to edit for accuracy. Wikipedia is open source. If we find mistakes, we can fix it. An error in a textbook stays there. A misquote in a news program remains said. If we want to engage our students in truly useful research, then get them involved in editing Wikipedia. Make them check their sources. Get them to be the information creators, not the takers(plagiarisers). That’s real learning. And it’s far more useful than banning. Throughout history, banning has never worked. Cigarettes and Drugs are still around. Inappropriate websites find ways to be accessed. Hey, Nazis and KKK members are still out there in numbers. Banning the use of Wikipedia is not going to stop us from using it. Just look at the stats above. So let’s get serious in Education and embrace this information provider, using it as a teaching tool for critical thinking. That’s my take. What about you? Does your school ban Wikipedia? Do you agree or disagree? How do you encourage good research in your students? Join in the conversation.